This week I decided to learn a little more about tax liens and foreclosure deeds. I read the book The Complete Guide to Real Estate Tax Liens and Foreclosure Deeds by Don Sausa. This book in combination with The 16% Solution will give you all the information you will ever need on the subject. The book is very short and is broken into 7 days, and the book is so short it would only take a slow reader about 4 hours to read it. The flow of chapters is really good. It works through the process from beginning to end, so if you were to use it as a reference it wouldn’t be hard at all to find what you are looking for at all. The thing I liked most about this book was the shear amount of resources it opened my eyes to. It shows websites to find the liens and deeds and also shows websites that will offer support for selling or research. I even think this book’s resources would be great for the average real estate investor. There isn’t a lot of information that I could convey to you that I didn’t already mention in The 16% Solution blog. 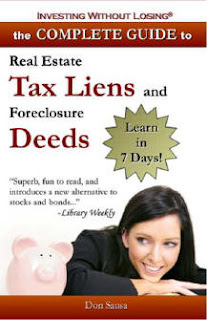 Although, if you are interested in tax liens and found they aren’t available in your state, consult this book because it has a full list of the states that offer foreclosure deeds. Minnesota, for example, does not offer liens, but does offer deeds. They are more expensive than liens, but you own the property directly after the sale. No one has to default on their payment for you to come into ownership of property because the state already owns the property and they just want to get rid of it. The deed is just a liability for the state, so they will give you a discounted price to take it off their hands. Personally, I think that investing in tax liens is something that should just be done as a hobby because the return on investment does not justify the time it takes to go through the whole process. However, it is really fun to search out and go to auction. Foreclosure Deeds, on the other hand, can definitely be worth while. They require much more due diligence, but your return on investment can be incredible. With the current domestic stocks and bonds market many people are looking for alternative investments and if you analyze the current economic climate you realize the dollar is in for a real shock... I'm talking hyperinflation. So looking for alternative investments is a great idea and it's fun to do. Trading in your American Greenbacks for a commodity is a great plan and if you choose real estate as your commodity, more power to you! With the book I will be reading and posting on next week, I will discuss alternative investments for you to trade your dollars for. As I said, this book would be great for anyone interested in real estate investing. I think it’s very clear and explained in very simple terms. If you have any questions on the book don't hesitate to ask. I would be more than happy to help anyone that wants it. Thanks for giving your insights about that book. I've been looking for someone who already read it and I also tried to find positive reviews online. I will get one when I hit the bookstore tomorrow. That is a good book to read about foreclosures. A foreclosure lawyer friend has that book. Make Your Portfolio CRASH PROOF!